This entry was posted in cars, chromeExtension, craigslist, firefox addon, google chrome extension, motorcycles and tagged 58.com, cars, chrome, chrome web store, chromeExtension, craigs list, craigslist, craigslist image, craigslist picture, ebay classifieds, ebayclassifieds, extension, facebook, facebook marketplace, firefox extension, image preview, kijiji, marketplace, minimum car model year filter, oodle, peak, photo gallery, tech4computer, thumbnail, webstore, 同城. Bookmark the permalink. Wonderful add-on you have here, But in recent version I have a really annoying problem. Now all the thumbnails will display. It does not matter if I use Gallery mode or not. I only get about 20 – 30 images at most then just blank fillers. This happens on CL, and I am on a super fast 20Mb Cable connection. Not knocking your stuff here but other plugins work fine to do the same thing, perhaps there is a time out option in the code that can be tweaked? Or maybe a refinement to the UI to allow a end user in cress the time out./? Thx for feedback. I was not able to re-create the issue. At most I get some photos not loading but those were external hosted ‘photobucket’ or similar service ones that has bandwidth exceed label on them. I don’t have any timeout set in the extension. Can you again test and see how its working, maybe in the Settings panel reduce the number of pics to 4 and see if that affects the loading. – Craigslist site & section (e.g. seattle.craigslist.org cars&trucks) you are using. – any other extensions (ad block like?) you might be using. – is your computer cpu+ram fast (recent years). Looks like a great extension, but when I downloaded/installed in on my Google Chrome, it doesn’t work! It doesn’t recognize that it’s on a CL site, so the little peace sign never appears in the address bar, so I can’t change the settings, either. Help?? Hi, Thanks for feedback. It could be that you might be using Google Chrome in Incognito (private) mode. Extensions are disabled in Incognito mode by default. If this is the case then you can enable it by going to the Extensions tab (wrench icon->Extensions. In newer chrome wrench icon->tools->extensions). In Extensions tab tick the checkbox next to Craigslist Peek that says ‘Allow in incognito”. Let me know if this is not the case. I’ve not been able to get the little peace sign in the address bar for some time now (few months). I’ve tried Chrome and Chromium, resetting the preferences for my browsers, uninstalling and reinstalling the plugin, but it just won’t work. I LOVED this extension when it worked. Do you have any additional suggestions to get it working again, besides the Incognito one? I can get every other Craigslist extension to work, but I just want this one. I’m just tested it (Craigslist Peek version 0.590) again on Google Chrome 6.0.495.0 dev, Google Chrome 7.0.503.0 canary build running on Windows Vista. It works fine for me. Are you using it on Mac or Linux? Does it shows as installed in Extensions tab (Wrench icon -> Tools -> Extensions)? Wrench icon -> About Google Chrome, will show the version of Google Chrome you are using. Also can you test if my other extension works in your browser. Please try installing Forum Preview and visit advrider forum to see if it shows the peace icon in address bar. Also try Craigslist Car Research extension and visit Cars section of craigslist, try couple of postings to see if it does anything. It could be that some other plugin or extension in your browser might be interfering with this extension. Maybe you can test with temporarily ‘disabling’ other extensions and plugins, just to make sure that they are not interfering with it. There is also a Firefox version of Craigslist Peek extension available though the Chrome version is better. I just now tested it remotely on friends machine (my own computer is a Windows Vista) running Mac Leopard/Snow-Leopard in virtual machine. There seems to be a big issue there on Mac. I would try to troubleshoot it. No issues in Windows but if you have installed my extension Craigslist Peek (or Forum Preview) in Google Chrome running on Mac then there is a memory leak. On Google Chrome menu View -> Developer -> Task Manager and see how much memory the extensions are eating. On my Windows it shows normal about 5000k to 7000k range but on Mac it was showing about 550MB, which is huge and was choking it. So for now if you are using Mac then use these extension in Firefox as they run fine in Firefox on Mac. Uninstall the extensions from Chrome. Thanks for looking into it. I am on a Mac running the latest version of Snow Leopard and using the latest builds of Chrome 6 and 7. Chrome 6 doesn’t seem to have a leak, but yes, Chrome 7 eats a ton of memory. I’ll just use Firefox for now. Thanks again for making a great extension; Craigslist is usable now! I have updated Craigslist Peek to 0.602. Can you check if it fixes the issue on Mac. 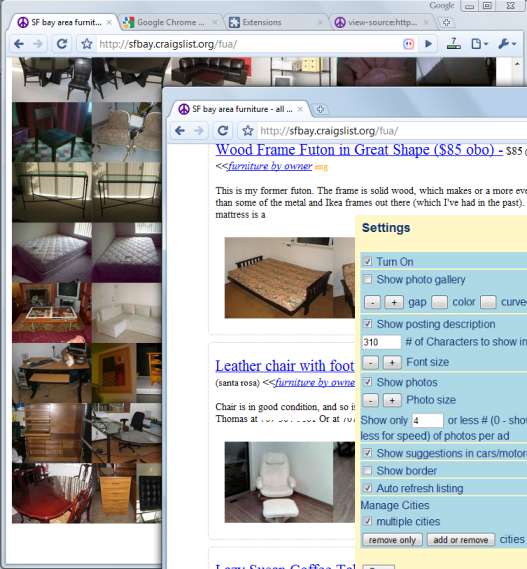 I’m using Craigslist Peek v0.042 on FireFox v3.6.8 and it really makes browsing Craigslist easier! The only improvement I need is to be able to make the text smaller. I’ve clicked the “Text Size” minus (-) button a million times and it seems to only go down to a certain size and it is still just a little too large for me. Otherwise, I think you’ve done a GREAT job!!!! Which OS you are using it on (windows / linux/mac)? This bug is only in Firefox 3.6.x, it works fine if you are using Firefox beta 4.0b. Seems broken on Firefox 4 (beta 4). Can you try the Craigslist Peek version 0.110 . See if it works fine for you. I tested it on Firefox 4b5pre (nightly build). Also there is a fix in it for newer design of Craigslist about sites page. If you enjoy this extension then please give rating on Addons page. Thank you for the quick response. I updated to 0.110 as you suggested, but it isn’t working with 4.04b properly. I can’t add any cities or adjust the font/photo size/type. Additionally the right click menu doesn’t have a background. Perhaps they made a change from B4 to B5pre that affects your plugin behavior. I just installed 20100818 Firefox/4.0b4 and like you said it doesn’t work in this version. From firefox 3.6.x version to firefox 4.0.x version, mozilla is doing lot of changes to browser Preferences handling, Add-on Manager, html5, regular expression (pattern matching overhaul) ..so one of these changes broke the extension. Its really hard to find out what exact change broke it. The extension started working again in recent version of Firefox 4.0b5pre nightly. I hope mozilla pushes out Firefox 4.0b5pre as Firefox 4.0b5 soon. For time being if you can’t use Firefox nightly then maybe try the Chrome browser (Google Chrome or Chromium or SRW Iron) port of craigslist peek. Thank you, I did upgrade to the latest nightly build and everything seems to be working again. The only issue is, the “menu” if you right click on the icon for settings has no background. I don’t know if this is something they are going to be resolving or if requires an update on you part. Mozilla deprecated the ‘menu’ part of the API and made it transparent. I have fixed it and it shouldn’t be transparent in next update. Hmmm… didn’t find any place to report it, but it seems that your extension is causing Firefox 3.6.9 to “forget” all toolbar settings every time I restart. As soon as I disable your extension everything started to work normally again. I already submitted the fix. Its awaiting mozilla editor review for public release. Can you try the latest version (from show All Versions) to see if it fixed the problem for you. Yep, the latest version did fix the issue. Thanks a lot! Btw, what’s the best place to report issues/suggestions? This blog is the good place to make suggestions and issues. I get notification of comment in email. Thanks for feedback. Its (craigslist peek) not ready yet. I got side tracked fixing some bugs, adding new features. Did finished porting one (craigslist phone search, simple extension) of my extension to safari. But then faced the issue of where to host it. Apple just links to the developer extension and doesn’t host it on there own servers unlike google. There are some other things that I need to sort out before publishing a safari version of extensions, hopefully in this month. Sometime back the chrome extension wasn’t working properly on Mac. I have fixed that issue and it should be working fine. If you want I can inform you when it gets available. Is Safari your main browser? Are you using Chrome only because of these extensions? I love this extension in Chrome but I like to use safari as my main browser. In fact, anytime I search c-list I go to chrome. I would love it if you could get this working for safari. Hi, love your new extension!!! Really a Godsend for avid Craigslist users. I’m using Craigslist Peek on Firefox 3.6.11 on a Mac. Everything’s flawless except the multi-city search. Is this still in beta? I can see the cities that are search-able and the + & – signs, but can’t click on them to add or remove. Anything I might be missing? Thanks so much for this great new addition! Hi, Thanks for reporting a possible issue. I don’t have a Mac with me right now to test it. I tested it on Firefox 3.6.11 in Windows Vista and seemed to be working ok. Clicking on ‘+’ highlights the city name next to it. And when I browsed listing on craigslist, it showed me aggregate list of the two cities I have selected. Can you click on the Craigslist Peek iconn -> Settings and see if Mulitiple Cities checkbox is ticked. Also was this feature working for you before? After clicking ‘+’ on 2-3 city names reload (F5) the page and check on top part of page to see if its showing your selected cities. Also if it still doesn’t work then can you try Google Chrome port of Craigslist Peek to see if the issue is in both browsers. I tested it on Mac Snow Leopard + Firefox 3.6.11, it seemed to be working fine. Wonderful ..this extension. But I can not figure out how to use it. Tutorials are in silent mode – NO SOUND! And I do not understand the visual shown. Too small. Blurred sometimes. Heck, I can not figure out how to bring the dang thing up to use it. Would you please put some spoken words with what you show? So I can follow along. Hi, Thanks. Which browser (Firefox or Google Chrome) are you using for this? On the right-bottom corner of the video there is a fullscreen button (nothing is written on it though, just 4 tiny lines). Click on it to make the video to expand to full screen. You can Pause & Play video anytime by clicking anywhere on the video. This was my first attempt at youtube video. I guess I need to make a new one. Thanks for answering. I know about full screen. That does not solve my problem. Because all my questions before come from viewing in full screen. I NEED SOUND WITH THE VIDEO. To tell me: why you highlight what you show? And why do you show what you show? I find my self saying: “So what? Why is he highlighting that?” I have no answer. I use Chrome mostly; firefox a little. No problem there. Installing is not my problem. Once installed, how do I get it to come up? I can not find anything in preferences. I can not find anything in my browser. Clicking on your icon only brings up preferences. How do I bring it up so I can do a search on what I want to search on? That is my BIGGEST question. Yes, please make another video WITH SOUND. Everyone gets better the more they use something. And getting better with YouTube will get you a ton more customers. hi. great extension. i’m using it in chrome on Ubuntu 10.10 on a Dell E1505 notebook – fantastic…! this is better than some of the others i’ve found, more adjustable – except for 1 thing: there are no dates or times (as are normally shown when you list CL posts). the only way to see when it was posted is to open the post, like in a new tab. that’s my only complaint about a really nice extension. Thanks Jon, I haven’t thought about the dates before. Are you using particular sections or search criteria where time of the post is critical? I just checked the ‘Computers’ sales/section of Craigslist and noticed that there is no date prefix to listing header. But when I search for ‘laptop’ under Computers then it shows ‘Jan 20’ date, no time info though. My thinking about the text+image preview was to cleanly show enough information so that the reader can make a decision within a second or two to skip the ad or click on it to see full page. Will see if I can display the time information easily, but this will take time as at the moment I’m working on Forum Preview extension. One suggestion though: include the time the item was posted on CL. Especially with the free stuff this is relevant information as it’s usually pointless to respond if the ad is already a couple of hours old. Thanks, in Google Chrome added Option ‘Show Date’ in Settings. Its Off by default. It will take some time to add it to Firefox. fantastic! i use this on Chrome & Firefox. it’s easy to adjust. my only complaint is the date & time needs to be displayed, probably under the title. it works on all of CL, i use it in community all the time. dang it, should have read the last comments. thanks for adding the date! I really enjoy your extension, it has changed my Craigslist experience from a frustrating waste of time to a convenient, efficient asset. There is one annoying feature that could be improved. I use the gallery view, but this forces the search functions to the bottom of the page. As the images load, I often see that I want to change my search string, but the search box is continually migrating down the screen as the images continue to load. I know of no way to pause the loading of the images, and wouldn’t even need to do it if the search box would remain on top of the screen as it is in the typical Craigslist page. Hopefully you could consider this change in any future versions of the extension. Thanks! Version 0.850 of Craigslist Peek on Chrome Web Store has gallery ‘on top’ (or bottom) option. Hey Thomas | I like your extension & use it all the time. Question: is it possible to filter out post’s that don’t include a location in the add? The Mega-Spam sites keep getting worse posting sometimes 100 ad’s straight just pointing you to a website. Seeing 100 post’s in a row all with the same image is just annoying. Anyway, will you consider adding this in the next update? Thanks for suggestion. I have added it to my To-do list and will soon implement it. I like the idea of your extension, but I had one very annoying problem with it. Every few minutes my browser would lock up for about 2-3 seconds, then be fine. Often I would have to wait. Once I disabled your extension, this problem went away. This happened even while I was not on a CL page. Just wanted to give you a heads up for a potential problem. Thanks Wired for the heads up. I believe this is only in Firefox. Fix is coming up in next update of Craigslist Peek on Firefox. Also adding auto-refresh time in Settings. Thanks for the feedback and useful suggestion. I have thought about this functionality and have another extension with filtering capability. It used to automatically remove the links that didn’t fall into certain criteria. Later Craigslist improved their listing page and add some of the missing features that my extension/script was providing. I have a Forums extension that one also uses expand/collapse feature similar to the ‘–‘ button on right top corner of Craigslist Peek. In Cars listing if you specify a Make year range then any post that doesn’t fall into criteria won’t be expanded. Initially I was just removing them, but later realized that some ads were genuine and were just poorly edited so they were falling out of criteria and user might miss out on them. I might add this hide/un – hide feature, maybe will have it off by default so that only advanced users can use it, as not all people are computer savy enough to intuitively figure out features. Craigslist Peek is GREAT! Thanks for the excellant implementation. Is it possible to bump the 550 character limitation to 2000? The 550 character limitation truncates long-winded entries. I will see if I can increase the limit in next update. Thanks for using it. Thanks for this! Trying to use it to check multiple cities to see if my stolen bike shows up anywhere. 1. When searching multiple cities, can the full results be sorted by date rather than just by city/date? 2. Is there a way to “select all” cities in a state? Hi: I really like your extension for Craigslist. I have way too many dealer adds in my area. I was wondering if I can filter out dealer adds? Dennis, There are two links (“by-owner | by-dealer”) just above the Search box on Craigslist’s car listings page. Click on the “by-owner” and it will only show postings by private sellers. This is how it shows to me for most US and Canadian cities. If you don’t find the ‘by-owner’ link then please let me know what city you are searching in so I can test it out too. Also if you see that some (dealer) is using a particular/unique word in ad title then you can specify that in “don’t show/expand posts..” field. Hope this helps. This is a great feature, but recently has decided to start popping up a changelog in the right hand corner of the screen whenever it’s activated upon opening a craigslist page. Makes it annoying to the point of being deleted. Thanks for feedback. Current version is 0.883. I added the changelog feature in version 0.880, 2-3 days ago. So the popup should have come up only 3 times total. I added it only to show important changes. Are you getting the changelog popup everytime you start browser? If that’s the case then I will have to fix it. Thanks for all your work on this – I have been using it for years. With the recent updates, there appears to be a new bar on the right, just next to the scroll bar – clicking on it returns to just title listing (quick peek without images), however, it is located in an awkward position, and if you pass your cursor thru it, also returns your cursor to the top of the page (i.e. if you are near the bottom of the page, and happen to pass through this bar, then you are returned to the top quarter of the results). How can I disable or manage this feature? Chrome Browser 18.05 – Craigslist postings. Thanks for reporting the issue. I have fixed the scroll bar going to top issue. Now it should go back to where it was before compact view of listing. I haven’t added any setting to completely disable it yet. You don’t have to click the bar, the quick-peek/compact-view happens when you just move mouse on the bar. Also it allows you scroll up/down page quickly. If you scroll page when your mouse is over this bar then the new scrolled position will match when you move cursor out of it to expanded list. I think you will like it after getting a bit hang of it. I’m also testing it and will further improve after more usage. Well, I have tried really hard to fall in love with this new tool, but I have failed. Maybe for the majority of users it is very useful, but I honestly wish I could go back to version .880 or turn this feature off. I can see where users that are using a wheel mouse might find some benefit, but since I am using a laptop touch pad instead of a mouse, every time I want to expand a listing, I invariably have to pass through this bar, which causes the posts to collapse, then re-expand (sometimes changing my place on the page). If the size or placement of the bar could be managed (or turned off) it would be great. Thanks for all your work on this – I know you have more rewarding things to do, and I think all users appreciate the effort that you have put into the app. When your mouse is over this tab, you can use keyboard’s up/down arrows or Page-Up/Page-down buttons to scroll up and down. If not scrolling then on expand it should open the same location as before unless there are some new posts added during that time period. Beautiful – much improved. It would be great to be able to disable or manage settings, but this is much better. Again, thanks for a great extension! Thanks for feedback. The ‘Google Chrome’ version of this extension has ‘filter’ box just below the Search boxes (top portion of craigslist listing page). The filter is labeled as “don’t show/expand posts that have any of these words (example: Dodge Chrysler Downtown): ______ filter”. Add words Homer Moose Sterling Seward in the filter and the extension won’t ‘expand’ the posts containing those words. The post titles will still show as I think some people add multiple city names in their post e.g (Soldotna, Homer). I will add the search filter in Firefox version of extension too. This will take time though. Craigslist seems to have changed their page layout. Now all the preview pics are blurry. Is this going to require an update to fix? Not much use if I can’t get a clear preview. Thx. Fixed the issues in new versions. New version (0.527) for Firefox is available under ‘View other versions’ link, as its pending detailed review from Mozilla. In a day or so will be posting a newer version than 0.527. It will have more fixes and some new features ported from chrome version. It will be available from “View other versions” link next to the Download link on mozilla. I use this extension inside Avant Browser which does not display the little button in the address bar. Any chance of getting a real options page where I can change the settings? Thanks for feedback. I will add settings to the Options page. It will take some time though as I am in middle of restructuring Firefox extensions. In parallel to this, you can also request the Browser developers to add the address-bar button capabilities. Craigslist seems to have changed their page layout, again. Title line splits to before and continues after text entry. It appears that CL is getting artsy-fartsy by putting title number in a rounded square. Thanks. The fix will take 2 or more days. It was an easy 2 line fix, but seems Google has stopped allowing Updates to Extensions with Manifest-Version: 1. It will take me some time to restructure code to make it Manifest-Version: 2 compliant. I assume that my issue is due to this layout change. Right now the price being where it is makes me associate the price that I’m seeing with the wrong listing. This is fixed in Firefox version of the extension version 0.542. You have to click on All Versions from listing page to see it as its awaiting review from Mozilla. Still working on the fix for Chrome version. It will take some effort. There appears to be an issue with Firefox 23. Following the upgrade, 0,544 doesn’t work about 95% of the time. However, I did find a temporary workaround by selecting Reload Tab AFTER Craigslist has loaded to kick start the app on both Windows XP and Windows 7, after which it runs brilliantly as usual. However, this only works for as long as the tab is open. You may already know about the FF23 glitch, but I thought I’d share the workaround since it was easier to explain to friends than the Google Chrome workaround. I can’t thank you enough for your continued effort and support of this app; it has saved me hours (no exaggeration) of frustration (scrolling through junk) trying to navigate Craigslist. I briefly tested it on Firefox 25 and 26 (newer versions of the browser in development). Extension seemed to be working fine in it. I will later try it on version 24 and see if there is an issue. It’s possible that the effect you noticed might be due to interference with other extension in your browser. Thank you for the advice, I managed to figure out which add-ons were in conflict with it. I’d never had a conflict before but can’t believe I didn’t think of that first. I love this extension but as of a week ago in chrome its not working right. No longer shows pictures in “List View” as it once did. 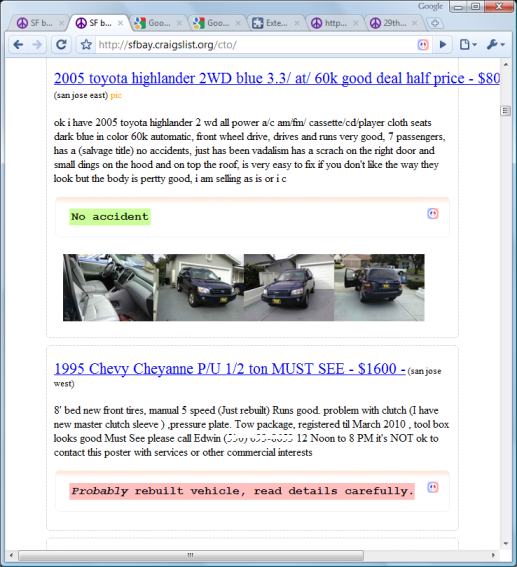 In “Pic View”, it makes Craigslist totally unreadable by overlapping all the ads. I am not sure if you were aware or not but wanted to let you know. Thank you for the hard work though on this extension. I do love it. The ‘Pic View’ is useless for those who are using Craigslist Peek. The ‘Pic View’ adds one image at the beginning of post title. I will later see if I can disable Craigslist Peek when ‘Pic View’ is selected. I just tested in Chrome, the ‘List View’ is working fine as expected. Do you have any other extensions installed in your browser. Maybe disable/enable them one by one to see if any other extension is causing this. Try other Craigslist city/sections, to see if the issue happens only in particular sections. Let me know if it still is not fixed. Great add-on, but I noticed that Firefox (24) was giving me massive CPU spikes and making my computer unusable after a while. when I disabled Craigslist Peek, the spiking stopped. Wanted to let you know. I’m running Windows 7, btw. The turn around time of adding fixes and mozilla approving them is long. So I usually add changes first to Chrome versions and then to Firefox. Please keep in mind that when you load the craigslist page, the extension does lot of work in first few seconds that makes cpu usage go up briefly. I’m using latest-developer version (27) of Firefox and the high cpu usage is very brief. Let me know if using version 0.550 fixes your issue. If that doesn’t do it then can you try disabling other extensions as sometimes two (firefox) extension conflict with each other resulting in slow browser. After 0.550 is approved I have some more changes to the code that are pending. I will add them later. Hi, LOVE this extension, thank you for all the great work. I updated to Mac OS X Mavericks and it seems that CraigsList Peek doesn’t work with it (using Chrome)…unless it was an update to Chrome that broke it. Thx, please try version 0.943 of extension. Perfect! Thank you, you’re the best. Seems as if something changed this week. Images will display on Craigslist if I just click on a category, but if I enter search criteria, the images will not display. Happens in Chrome and FF, multiple computers – any tips? Thanks @Don, @DBS, for reporting the bug. Craigslist did a minor change in their Search results page layout. That caused the issue. I have fixed it in Chrome Craigslist Peek version 0.943. Update your extensions page and see if it solves the problem. Edit: I have submitted the fix for Firefox (Craigslist Peek version 0.551) also. Normally Mozilla takes days and sometimes weeks to approve update, so may not be available for auto-download (add-ons update) immediately on Firefox. Though you can manually download it by going to the link in this post. Can I create adds in multiple cities at the same time with your extension? Hi, Thanks for feedback. I haven’t worked on creating posts functionality. I did thought about it (plus to format posts in such way that they are quick and easy read for the buyer), but didn’t worked on it as I thought only few people would use it, and some might use it to spam CL. Unable to find any settings for Craigslist Peek – wtf??? Hi, I just tested on latest Chrome and it seems to be working. It shows icon in address bar, when viewing the Craigslist (any) listing page. See, if “Craigslist Peek” is listed there. If you are using browser in “Incognito Mode”, then see that “Allow in incognito” tick box is checked. If still not seeing it then try re-installing it. Disable all other Extensions on chrome://extensions page and see if that fixes it. You can re-enable them after the test. Somehow I got the icon in the address bar to appear. Functionality, does this extension depend at all if you have RSS feeds enabled/disabled? I clicked on something at the bottom of a Craigslist page when the icon appeared, and about the only thing was the RSS icon and a ‘?’ icon. Now, I have ‘multiple cities’ checked, but I do not see different cities when shopping. For example, I have Delaware and Baltimore. MD selected. You don’t need to have an open window for each selected city, in order for the multiple city to function, do you? Results I get on the map for Delaware ads and Baltimore ads are definitely not the same. I would have though that whichever city I was open to, I would find the other city’s ads, but the maps clearly show I get different locations when selecting ‘Delaware’ compared to selecting ‘Baltimore’. It seems that there is some issue with the multi-city search feature. Most likely craigslist changed something in their website. I will take a look more closely later. Thanks for bringing it up to my attention. Fixed multi-city listing feature in version 0.945 for Chrome. Will fix it in Firefox shortly. The latest firefox fix would most likely be listed under all-versions page. I started out with version .945 for Chrome a few days ago, and was unable to perform multi-city list. I was able to select different cities, and see my city selections, but when on Craigslist site I could not get it to ‘work’ – there was no indication it was working. All listed postings came only from the area I last selected, and that’s it. When looking at the map feature, each city selection showed distinctly different locations – no overlap. Do you need to do anything other than select the cities you want to ‘see’, then start looking at ads ‘within’ one of those selected cities? Did not see any instructions at all……. An even bigger issue, as I just found out, is that none of the selling links ‘work’ with this extension (.945, Chrome). Every time I click on a link I get the message “Google could not find the undefined”. This is regardless of what view I am in…… so I can’t even consider using this extension….. at all. You say you made some changes today to the Chrome version………. but you did so and did not change the version #??? Like I said before, I’ve been (trying to) use v .945 for several days now. Software mods should warrant a rev change, absolutely…. or both the programmer and end users get confused… definitely a ‘must do’. I just tested .945 in 3 different versions of Chrome. It worked fine in all except one old version of chrome. The old version is giving that ‘undefined’ link. And that is from my Yesterday’s code change to version .945 (previous version was .943). I will fix this later Today. In meantime check if your browser is latest version. Well, good news and bad news. For some reason, Chrome was at 31.0.1650.57 m with the message “updates are disabled by the admin”. Made a registry change and now allowing updates, Auto updated to 31.0.1650.63 m.
My areas I selected are: Los Angeles and the state of DE (near where I live). I open Craigslist after selecting regions and then closing and it opens to the last city selected, which is LA)…. and I tried some queries, Nowhere did I find any listings from DE. ; all were from LA. Do you have to have an open tab for each of your regions for the multi-region feature to work? Is there any text notification telling you that certain postings are from one of the other regions you selected? One final comment. I have tried the ‘Craigslist pop.’ extension and am able to regain all the functionality of hyperlinks in Craigslist. Does not do multiple cities though. Just started today: In Chrome, on Win7, if Craigslist Peek is enabled, all links in Craigslist go to “Undefined”, and no image preview is working. Disabling Craigslist Peek allows you to click on links and view ad. I have uninstalled Chrome and re-installed, got the latest extension for Craigslist Peek – same result. Not sure if it is just me? Fixed it in version 0.947, please update extension. Go to Extensions page (chrome://extensions) and click on “Update extensions now”. Try it and if it still gives “undefined” issue then please report back. Also let me know if using latest chrome or old. where is this at? I only see v 0.945 in the Chrome store. When updating extension do you first need to deleting the existing version on your PC? You don’t need to uninstall for update. Chrome Webstore is taking time to publish it. I submitted .947 15 – 20 minutes ago. Usually they publish it within few minutes of new version submission ( pretty fast compared to firefox which takes days or weeks to publish ). It’s available now. The multi-city listing is shown on same page. So if you have added Delaware and LA cities from http://www.craigslist.org/about/sites and then go to Delaware site. And search for computer ‘monitor‘ in Computers section, then it should show Delaware listing on top and listing from LA at bottom of page. got it. First off, I ended up on the DE page because that was the last city/sate selected. So, all DE posts should show first. How do I switch over to, say, make LA my current city? Use the ‘nearby cities’ option on the same C.L. page? I can’t go back to the main Craigslist page to select a different city as my home city, since that page is different than the main w/o the the extension; WITH the extension you can add/remove regions. WITHOUT the extension you select a single region to search. Order of city: It’s random, depends more on which (ad) data extension fetched/received first. From what I understand is that you want to open LA page and in LA listing have results shown from Delaware also. For this you need to add only Delaware city. No need of adding LA. When you open LA or any other city listing, the extension will show results of that city, plus the results from Delaware. * Open any listing and click on extension icon (in address bar) to ‘add’ or ‘remove’ city. * First Remove the cities that you have added. Open extension settings ( click icon in address bar), click ‘Remove only’ or ‘Add or Remove’. Click ‘Remove city from’ (line at top of page with pinkish background). 1. From any listing page, click extension icon -> ‘add or remove’ button. 2. From your (http://delaware.craigslist.org/) craigslist page, click on the ‘Craigslist’ word located at top-left corner (basically first occurrence on page. Its in big size text) of page. This should open the city selection page. Though this does not list nearby ‘regions’ or sub-city (e.g. ‘Central LA’, SF Valley, .. for LA). I did added a way to add those sub-cities, but it was giving some weird issues (esp in search queries), so did not released that part of the code. Will have to spend some more time working on that. 3. Click ‘us states’. From your (http://delaware.craigslist.org/) craigslist page, right column, click on ‘us states’ and then click on e.g. California, it should allow you to add/remove California cities. Or just click on the Los Angeles to open the LA page. You can click ‘star’ in address-bar to bookmark it. Next time just type losangeles.. in address-bar and it should find the craigslist page bookmark. I couldn’t reproduce it here, though I have seen that happen in Firefox (a while back). The way to (temporarily) fix it was to open Settings (click icon in address bar) and click on “‘+’ ‘-‘ Font size” button. I believe some random poorly formatted craigslist post is causing that issue. ah, typing in “chrome://extensions” got me there; it just gets you to your extensions in your browser settings. Now have version 0.947. Appears to work, though it can be difficult to determine what order (with respect to city) the listings are in, if any order at all. Is there some default ordering, or is is some type of random mix? I noticed that after viewing a good many postings in a category, the title link fonts gets huge (to the point where it can only be read if you hover over the title). Is this large font size supposed to signify something? Listings from both my selected cities exhibited this, so it’s not a way to identify city. Thanks for the walk-through, Would be great to have this information on one of the tabs for the extension, in the Google Store – would help reduce traffic here, I’d think. “…From your (http://delaware.craigslist.org/) craigslist page, click on the ‘Craigslist’ word located at top-left corner (basically first occurrence on page. Its in big size text) of page. This should open the city selection page. Though this does not list nearby ‘regions’ or sub-city (e.g. ‘Central LA’, SF Valley,” – You are just saying that you need to know what the nearby cities are, so you can add them to the search if you want to include “nearby cities”, correct? That there is no way to simply “include nearby cities”.. Are all the standard Craigslist cities shown on the city selection page (add/remove)? I am trying to understand the limitation which you describe, directly above. Did something change? Starting today at noon, as CL listings with images are loaded, and the images begin to display, the listings begin to sink down and slide over to the right. If there are enough listings with images, then the page slides completely off of the monitor, and you must scroll down and over to the right to view the truncated display. Had been working fine earlier in the day. This is in Chome Version 33.0.1750.154 m on Windows 7 PC. Turning off CL Peek resolves the issue (but of course, disables all functionality). Must have been a temporary glitch, perhaps on the CL side – app is working as designed now. I’ve been using and loving Peek for some time now, but now it doesn’t come up anymore when I call up a CL site. No peace symbol at all. I’m running the latest Chrome (Version 37.0.2062.124 m) and the latest version of Peek: 0.950. I have Peek enabled, I’ve uninstalled, reinstalled, restarted Chrome, tried different CL sites all to no avail. The “Craigslist Car buy sell research utility” does not function either. Thanks in advance for your help. Thanks for the feedback. I just tested peek in latest chrome and it worked ok for me. If you are using Chrome in InCognito mode then that mode automatically disables all extensions. In chrome://extensions view (where all installed extensions are listed) make sure the check-box under Peek, “allow in incognito” is checked. Craigslist shows page in ‘thumb’ view by default. 1. Click ‘list’ on top part of page. 2. Click reload/refresh/f5 button. This will start craigslist peek. Let me know if that still doesn’t solve the issue. Also let me know which craigslist city/site you are checking so that I can also test it. Thank you for covering the basics again. I don’t use Peek in the Incognito mode, only the “regular” mode. I tried enabling Peek in the incognito mode, but it still doesn’t come up…either in an incognito session or in “regular” mode. I’ve tried the “List” mode, which is the default for me, “Thumb”, “Gallery” and back, using the F5 refresh in each mode. No love. My “default” city is Chico, CA, but I have also tried it with SF Bay and Sacramento. Still no sign of Peek. Oh! Wait. I just tried one of my saved searches and Peek comes up! But if I go to https://chico.craigslist.org/ and click on any category, say, “Tools”, then the listings come up, but no Peek. If I call up a saved search and Peek comes up, then I can go to “Tools” and Peek stays with me. Hope that helps! Love the program; thank you so much. I’m suspecting that your saved searches link have prefix http:// compared to prefix https:// when you are signed in and Peek is not working. The extension works only on http:// links, so if you are signed into craigslist then open a new tab and use http:// prefix there. See if this fixes the issue. I will add the https:// support in next release of Peek, though this will spook people as browser will give extension’s ‘permissions changed’ warning message. Thanks for feedback and I will try to fix it. Yes, this seems to fix it. Thanks again and I appreciate your help. I can easily work around this minor issue until you can fix it. Updated Google (Version 37.0.2062.124 m) the other day, and CL Peek description listings have not worked since. Example: http://sandiego.craigslist.org/search/zip shows thumbnails and titles only. I have tried reinstalling and changing settings but nothing works. Also cannot increase font size now. I am running Vista. Anyway to get this working again? Thanks. It seems Craigslist has changed the layout of website. I will make changes to code and update the extension soon. I also had the same problem on an old laptop running XP. I uninstalled and reinstalled Peek on both computers. Problem is now resolved on both. Peek is back to normal. Love this extension! I noticed last version update was in 2010. Is this extension still supported then? If so, I have no way of accessing settings. Can’t press on any buttons when I click Options in the Chrome Extension menu (it only brings up a screenshot) and there is no Peek icon in the address bar, even on Craigslist pages. It seems to be doing something because I see extra features when in Craigslist, but I have no way of accessing the Options. What am I doing wrong you think? I just tested it on sfbay.craigslist.org , it seems to be working fine. 1. Open the craigslist (any sale section) listing page. 2. Below search bar you will see four links “list | thumb | gallery | map”. Click on “list”. This should make the extension do stuff ( show post summaries and pics) on the page. And also it should show the extension icon at right corner of the browser’s address bar. Click on icon to show Options/Settings. If it still does not show icon, try disabling other extensions temporarily. Hope this fixes the issue for you. Got it! Thank you, it worked. Though you gotta say, it’s very iffy. It’s hard to find, almost impossible, and doesn’t follow the standard operating procedure known by every Chrome user. It requires tricks to set options. Next thing would be adding other cities/locations. I was able to add my current location but am unable to add others. How do you do that? Clicking other circles on the map does not show the +/- signs, only the name of the location. Starting yesterday – in Chrome Browser, images are not appearing. When I got to CL, click Cars+Trucks, all – ads appear, and the Peek icon is at the top of the page, but no images appear. Double-checked that all CL Peek settings are correct (I have used this extension forever). Curiously, there is a red line across the top of the page – like I would see if new ads were populated. Using the CL thumb/gallery settings does show images, but that is no replacement for all of your features. Have checked on multiple computers (all Win7). Craigslist Peek DOES function in the Mozilla Browser (not my preference). Thanks for reporting this. I’m looking into it. Most likely craigslist has changed something in their page for chrome browser. I updated it with fix, try version 0.954. Thanks for feedback, I will try to fix it soon. Seems to be working. Once the page is loaded click on the ‘list’ view and then click browser’s Refresh/Reload button. Let me know if it’s some other issue. Also try disabling other extensions and then try craigslist. And re-enable them one by one. It suddenly is not working in the personals sections. It works find in the real estate sections and for sale. But once you go into the personals the icon in chrome that is normally in the address bar no longer even shows. Windows 7 – Chrome browser – Craigslist – list view – Just started today – Images are severely cropped – as if they are too large to appear in the space provided under the posting title. I have played with image size, but it is as if there is not enough room for the image to be displayed. I have toggled “show description” off and on (issue is worse if show description is turned on). I updated the chrome version of craigslist peek with fix. Thanks, as always – working perfectly today. I am not aware of any extension that the developer is willing to fix as quickly as you have always done, especially when the issues have nothing to do with your app, but always appear to have been caused by changes on CL – truly appreciated. * In Gallery mode, removed some texts from on-hover post description. Took some time to upload it as was having trouble with Google account.